Everyday I arrive at work early in the morning, and each morning I will be hunting for parking spots in the company. It has become a daily ritual to locate the perfect, and safe spot. This morning, after parking my car, upon reaching my office I had the sudden urge to look down at the open parking space below. 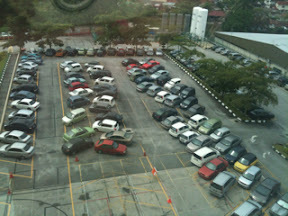 This photo was taken to illustrate the rather weird ways some drivers park their cars. If you were to actually observe the top right corner, the 3 Myvis were way out of their allocated spaces parking out of line. Probably they were rushing to work, and didn't feel the need to get their cars aligned. Just a Friday morning observation..